The extremely powerful MHG100 is designed for applications requiring high flow rates as in open systems or large volume chambers . 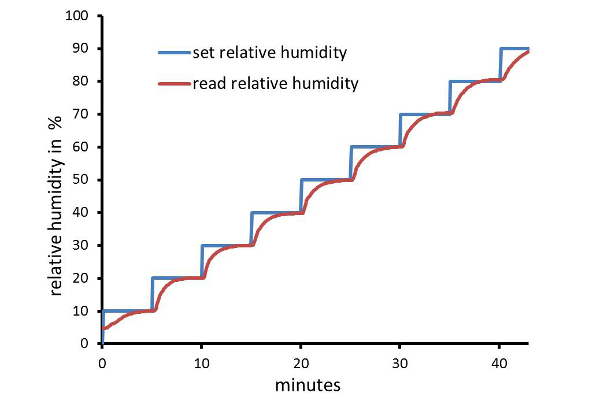 Humidity control in a closed loop and at controlled temperature allows for accurate adjustment of relative humidity even in challenging environments. The MHG100 provides a maximum flow rate of 15 l/min which is suitable for humidity control for chamber volumes up to 250 litres. The modular setup with symmetrical gas supply in two lines and the broad temperature and humidity range make the MHG100 a perfect match for the most diverse target systems. As an OEM product, the MHG100 can be easily integrated into any instrument setup. 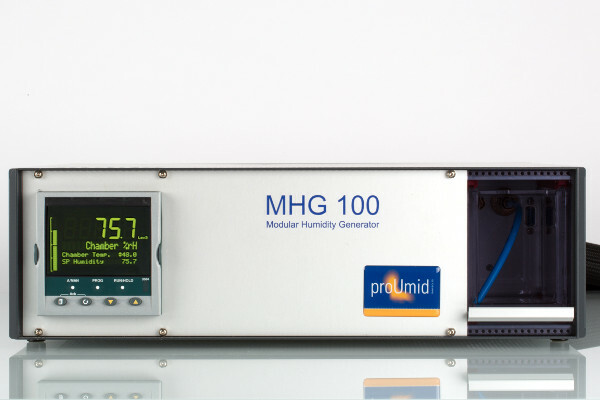 Learn more about the special features of the humidity generators of the MHG-series. The MHG100 consists of a central control unit and two temperature-controlled supply lines to the target volume. The heart of the MHG100 is a powerful central wetting and mixing unit that provides a constant gas flow of controlled humidity. Humidity control is set by mixing dry and saturated gas. 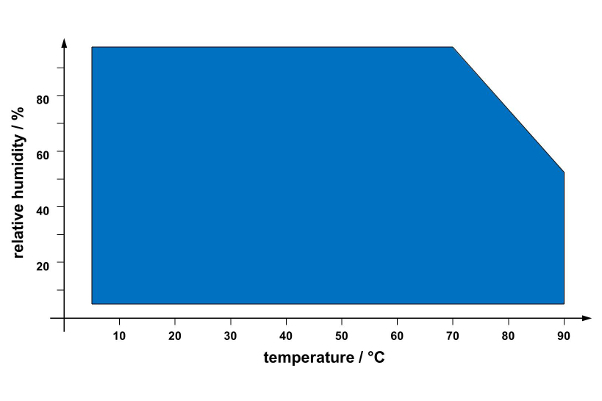 The temperature in the MHG can be adjusted to the conditions in the target system manually or by an automated algorithm. The MHG100 can be operating in the range 5°C to 90°C. Humidity control is available over the full range from 5% RH to 95% RH. The compact but powerful MHG100 provides very high flow rates even at high temperature and high humidity. 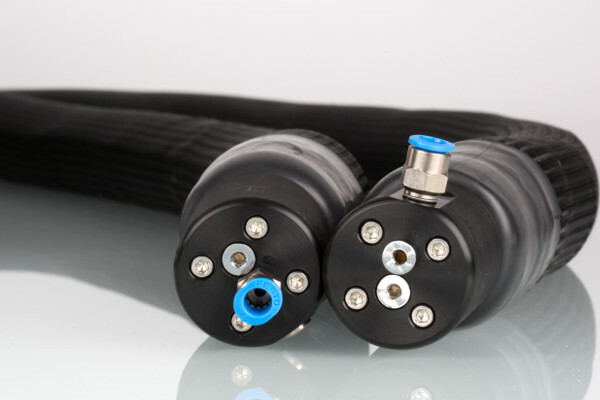 Temperature control in the supply lines is including an automated or manually configured temperature offset. Humidity control up to the saturation level is ensured even at very high temperatures without any risk of condensation in the supply lines. 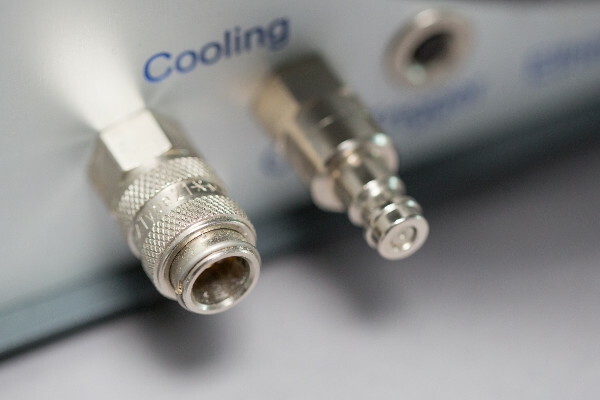 A cooling circulation thermostat can be connected to the MHG10, allowing for operation at temperatures below room temperature down to just above the freezing point. 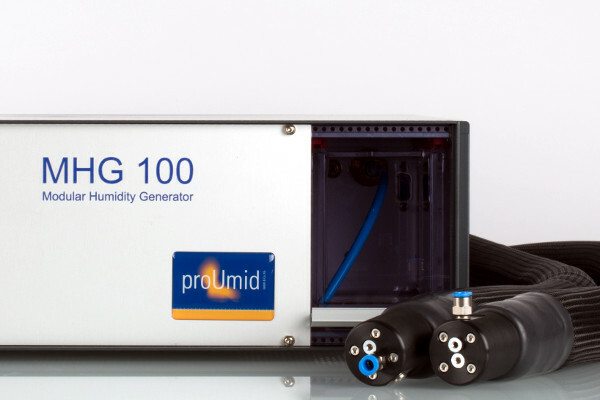 The MHG100 is equipped for connection of a freely configurable temperature and humidity sensor interface. Any sensor with an anologue signal output can be connected. Operation via user interface directly at the control unit is clear and straightforward. RS232 or Ethernet interface are available for remote control. The Modbus interface is fully accessible, allowing for a full integration of the MHG100 into user specific analysis software.